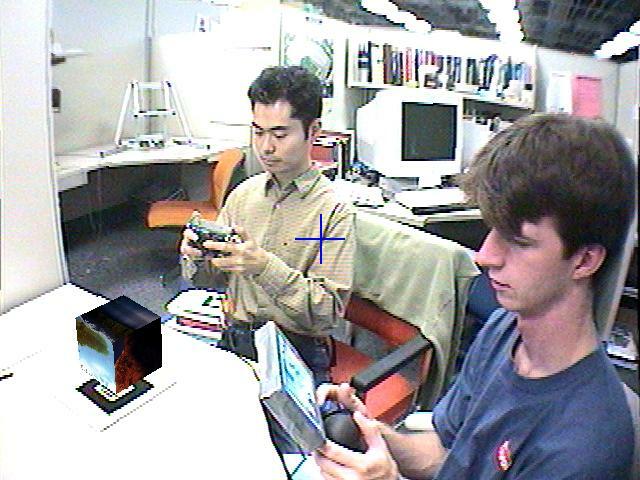 During 2001-2002, I collaborated with Dmitryi Mogilev, Mark Billinghurst, and Kiyoshi Kiyokawa in developing demonstrations of a device called the Augmented Reality Pad (AR Pad). 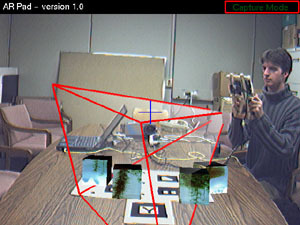 This device allow groups of individuals to view synthetic objects in real scenes, creating a collaborative augmented reality. Unlike a head-mounted augmented reality display, the AR Pad is unencumbering, allowing users to see each other’s eye gaze and facial expressions. These non-verbal cues are commonly used in face-to-face collaboration. There are many potential applications for this platform, including special effects previsualization, computer gaming, and teleconferencing. Images and a movie of the AR Pad in use are below. 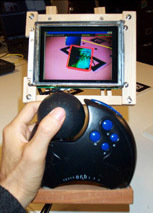 The ARPad was first demonstrated at the 2001 International Symposium on Augmented Reality (ISAR). 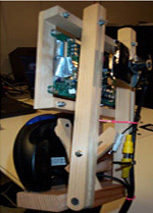 An updated version of the demonstration was shown at the 2002 SIGCHI conference. A technical paper describing the AR Pad can be downloaded here (.pdf format). 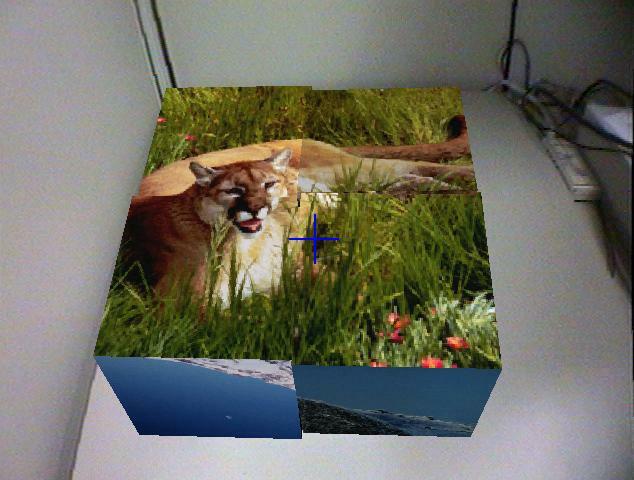 The AR Pad Demonstration Task: Two users collaboratively solve a puzzle. External View: Two users view the computer generated puzzle floating in the real world. Each user can pick up, move, and rotate each puzzle block. 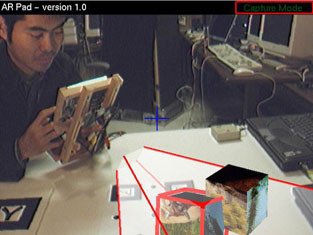 Screenshot from AR Pad Unit: The augmented reality puzzle and the other user are in view. The red lines show the other user’s view frustrum. The red lines also show that this user has selected the left block and is putting it into the correct position. 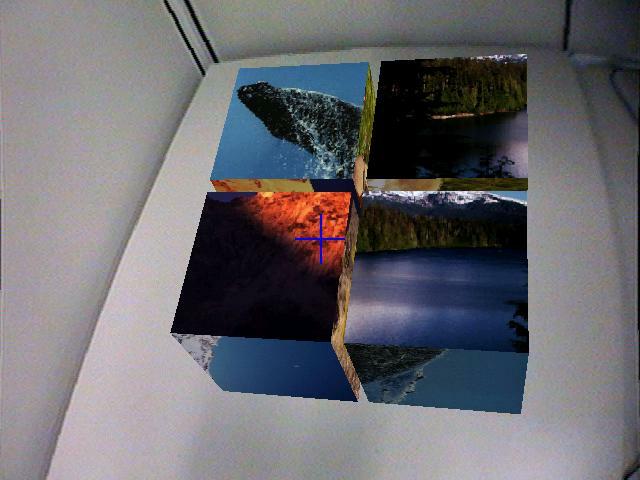 Screenshot from AR Pad Unit: Again, the augmented reality puzzle and the other user are in view. The Solved Puzzle: All blocks have been rotated and placed in their correct positions.